DULLES, Va. -- A commercial Cygnus cargo spacecraft, owned and operated by Orbital Sciences Corp., aborted its rendezvous with the International Space Station on Sunday after the automated spaceship encountered a data glitch before commencing final approach. 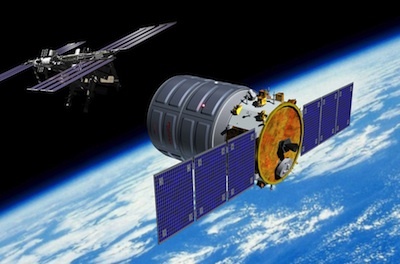 Artist's concept of a Cygnus spacecraft approaching the International Space Station. Credit: Orbital Sciences Corp. The Cygnus resupply vehicle flew about 2.5 miles below the space station and will set up its trajectory to try to approach the complex again early Tuesday. Loaded with more than 1,500 pounds of food, computer equipment, spare parts and student experiments, the unmanned cargo freighter was supposed to close in on the space station with GPS and laser navigation aids and move into position about 30 feet below the outpost, close enough for the station's robotic arm to reach out and grapple the free-floating Cygnus spacecraft. One of the prerequisites for a safe rendezvous is the establishment of two-way communications between the space station and Cygnus, allowing relative GPS navigation and commands to flow between the spacecraft while they fly within about 14 miles of each other. The communications systems on the space station and Cygnus made contact at about 1:30 a.m. EDT (0530 GMT) Sunday, but the cargo ship's computer "found that some of the data received had values that it did not expect, causing Cygnus to reject the data," Orbital Sciences and NASA said in a joint statement. The Cygnus spacecraft uses a Japanese-built communications system called "PROX" for close-range data links. During the early phases of the freighter's rendezvous, Cygnus uses the PROX system to relay navigation information between itself and the space station, allowing the craft's guidance system to compare the positions of the two vehicles and plot its next move in the rendezvous. "Orbital has subsequently found the causes of this discrepancy and is developing a software fix," the statement said. "The minimum turnaround time to resume the approach to the ISS following an interruption such as this is approximately 48 hours due to orbital mechanics of the approach trajectory." Later in the rendezvous, when Cygnus is inside 1,000 feet from the space station, the outpost's three-person crew can issue emergency commands to the cargo ship through the PROX radio if they observe any problems during rendezvous. Eight technical demonstrations were planned Sunday to prove the Cygnus spacecraft - on its first flight - can safely fly in close proximity to the space station, beginning with the relative GPS navigation demo cut short by the data glitch. The commercial cargo craft is on a test flight under NASA's Commercial Orbital Transportation Services program, a public-private partnership in which the space agency and Orbital Sciences shared the costs of developing the Cygnus and its Antares rocket booster. Eight operational Cygnus resupply missions, along with a dozen cargo deliveries by SpaceX, are on NASA's manifest through 2016. Orbital has a $1.9 billion contract to cover the flights. The Cygnus spacecraft was scheduled to demonstrate on-board targeting and conduct an autonomous maneuver using relative GPS navigation, then ground teams were supposed to activate the spaceship's laser navigation system, which feeds range and closing rate data to the Cygnus flight computer during the last phase of the rendezvous. Astronauts aboard the space station also planned to turn on a control panel inside the complex and send retreat and hold commands to Cygnus to prove the crew can intervene in the event of an emergency. The rendezvous demonstrations will now be rescheduled for Tuesday. Frank Culbertson, Orbital's vice president of advanced programs, said before launch the Cygnus spacecraft has plenty of fuel to loiter in orbit to overcome problems and wait for a rendezvous opportunity. "We can loiter on-orbit waiting for the rendezvous for a week, or even up to two or three months if necessary," Culbertson said before Wednesday's launch. "We've got the fuel and the technical capability to go for an extended period on-orbit."